After touching down into Doha after a very relaxing 14 hour flight from Sydney, we were met at the door of our A380 by a personal assistant. Having travelled in Qatar F a couple of times before and since, the provision of assistants is a little hit and miss (much like buggy service in Thai First at BKK airport). On this occasion I thought of it as a welcome surprise and really enjoyed chatting to our PA about her home country of Sri Lanka, during our walk to the lounge, since we were planning a trip there at the time. Kamara walking with our Al Maha services personal assistant. Upon reaching the lounge our PA told us to make ourselves comfortable inside and she would deal with the lounge check-in formalities. We then made our way around the corner and along a very impressive, museum-like hallway filled with artwork. …stopping to look at some of the ancient pottery on loan from the Museum of Islamic Art on the way. Often you’ll transfer through a country and feel a certain emptiness, knowing that you weren’t able to leave the airport and explore. This small cultural touch really offset that sense, adding a welcome cultural injection to the transit experience. Walking into the main atrium of the lounge I was immediately struck by its astonishing scale. The column of illuminated water falling into an enormous bronze bowl is really quite a sight to behold. The expansive space has been described as sterile by some people and it is not an entirely unfair accusation. The lounge is so quiet, cavernous and awe inspiring that it doesn’t feel like a space in which to kick back and have fun. If you’re expecting the Virgin Clubhouse you’ll be disappointed. It is however one of the most striking interior spaces I’ve ever spent time in. The calm and tranquility is a world away from the airport terminal below and it does feel quite special to have the opportunity to treat this space as your own. If anything, the atmosphere – whilst undoubtedly serious – also has the benefit of discouraging the types of people who would otherwise run around screaming or having loud conversations on their phones. This kind of space demands respect and decorum from its occupants and during my visit everybody appeared to have developed a tacit understanding of this fact. Walking beyond the water feature you come to the bar and restaurant area. The staff at the bar seemed to know their wines quite well and were very keen conversationalists, always politely chatting with customers at the bar. The lounge has an absolutely fantastic wine selection, which during my visit included Cuvée Louise, Comtes de Champagne and Krug. As you can see, the spirits were not quite on that level, with Jameson, Jack Daniels, Absolut and Jäeger on display. As we made our way to the dining area we were greeted at the large brass greeting podium and shown to an available table. Just as we sat down, our PA came to hand us our passports and boarding passes. She also wrote our gate numbers on the boarding passes and advised us to leave early as we were due to depart from a bus gate, far away from the lounge. Not the best news but at least it was delivered with ample grace and advance notice. I ordered a glass of Comtes de Champagne as soon as our menus were handed to us and this was promptly delivered. It wasn’t poured at the table though, which I was surprised by given the extent to which Qatar clearly intends to deliver a true restaurant experience. A small detail, but usually small details don’t elude this airline. After breakfast we went to explore a suitable space to settle down for the next couple of hours. Enclosed booths leading off the main atrium. Bright and open seating areas without much table space or power. The quietest nook of the lounge. Nothing much going on here. Actually this was the quietest area, with some really cool looking faded glass partitions and ample table space and power. This is probably the best business centre I’ve ever seen in a lounge. So spacious, quiet and bright. We ended up settling into this area close to the buffet area and the concierge desk. There were plenty of power sockets here, we were close to snacks and drinks plus there was a decent amount of natural light. If your next flight is in F and departing from one of the far gates, you’ll walk through the doors on the left to the limo that will drive you to your gate. The second dining area is a lot more relaxed and informal, with the feel of a coffee shop to it. A selection of made to order salads and sandwiches are available in addition to the buffet items. After plugging a few of my devices in I went to speak to a member of staff at the concierge desk. I had noticed that none of my outbound flights from over a week earlier had credited to my AA account and had credited to QR instead, despite my AA number being printed on the passes. Unfortunately the first person I spoke to just didn’t have a strong enough grasp of English to understand, she asked me to wait for her colleague to come over. Twenty minutes later Sebastian greeted me and quickly explained that I would need to fly before being credited miles. I explained that I had already completed these segments and had already been credited the wrong kind of miles, I just needed this to be reversed so that they could credit to my AA account. At this point Sebastian was actually very helpful; he spent a really long time on hold and finally got through to a back office team. It seemed that they were also struggling to understand what was going on, as at one point he had to loudly explain, “of course I didn’t just print a boarding pass for the past. The customer has already flown and his pass shows the AA number”. Despite trying very hard Sebastian got absolutely nowhere and suggested that I should just email customer services when I got home. Generally airport staff are more empowered than those in the call centres but it seems like at Qatar this is not the case. I ultimately ended up having to intermediate an email exchange between AA and QR, first getting the Q Miles returned and then waiting an additional 4 weeks for the AA miles to be credited (during which time Qatar still asked for photo proof of my flights, despite having credited me miles for them in the past). Anyway. Back to the lounge. I asked about availability of bedrooms during my visit but was told that they were all fully booked. Given the low cash price to enter this lounge, if you have an overnight layover it can make a lot of sense to just come here rather than paying for the airside Doha Airport Hotel, but be mindful of the fact that you may find yourself without a room. If you have kids you are extremely well catered to (which explains the quiet in the main lounge areas). The Family Area has its own separate dining facility, featuring a variety of made to order dishes as well as buffet items. Toys, activities and plenty of space for children of all ages. If you roll with a full entourage there’s even a separate nanny room! First time I’ve ever seen that in a lounge. The physical space is stunning, as is the list of available champagnes. In fact the champagne list is the best of any airport lounge in the world. The Flyertalk thread dedicated to Al Safwa even chronicles a brief period during which they served Krug Clos du Mesnil 2003 here, a very exclusive bottle that retails at over £900. Even the famed Emirates wine program doesn’t offer wines of this level on board or in the lounges. However, the food is rather basic both in terms of presentation and in terms of ingredient quality. The staff are affable and genuinely attempt to be helpful but sometimes this can result in them being a little misguided or even overbearing. When we first sat down in the lounge, a server came over to introduce himself and asked if he could help to arrange our bags. We were still settling down and moving things around so I said I was happy to leave things be for now. Perhaps there was a misunderstanding but he continued to touch our things and in the process dropped my camera on the floor. Now mistakes happen, I get that. However when somebody tells you not to touch their stuff there’s probably a reason. Later when we ordered drinks from the seats near the buffet, that server mentioned that we would have a car transfer to our next flight as this was offered to all First Class passengers. I’d not heard of this before but took him on his word and only headed to the desk to enquire about a transfer at around 40 mins to departure, just when the flight status turned to boarding. It turns out that this service isn’t offered to passengers flying to a destination only served by a Business cabin, as we were, even if they’ve just come off a 15 hour flight in First. Instead this service is offered to passengers with an onward flight in F, which means a limited few A380 destinations… or pretty much all short haul flights since Qatar refers to short haul Business as First Class. If the rule is too complex for the lounge staff to fully understand then customers are ultimately going to become frustrated. As we were. In the end we were told that no exceptions could be made, even when a lounge agent was to blame. We would just have to run to our next gate. I don’t think I’ve ever run as fast in my life. Not the best way to end our visit but kind of the perfect metaphor for the lounge as a whole. A slightly impersonal and incomplete experience, despite the undeniable wow factor. If Qatar improved the food and delivered consistent ground service like Air France or Lufthansa do, this lounge would be the best in the world. 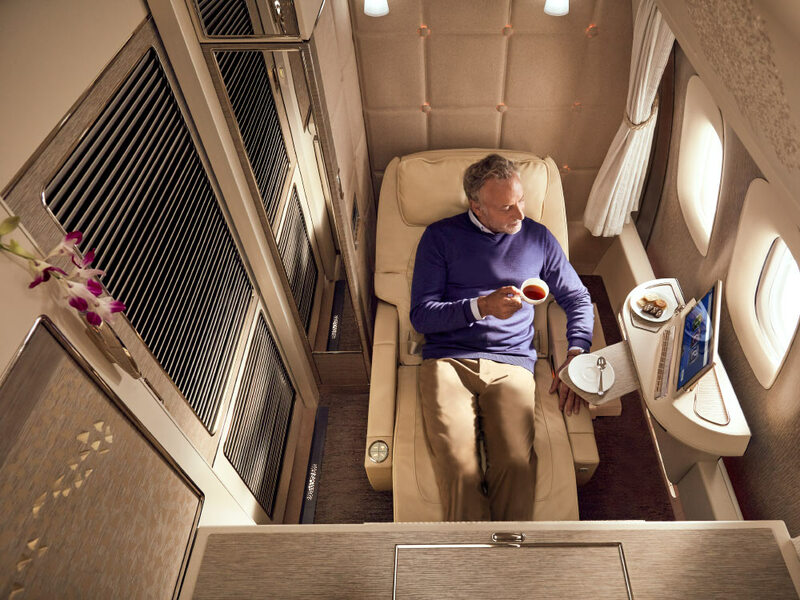 This is speaking from the perspective of a passenger in First Class, as a Business Class passenger however the value provided by a 250QAR upcharge is exceptional and I would gladly pay it in a heartbeat.